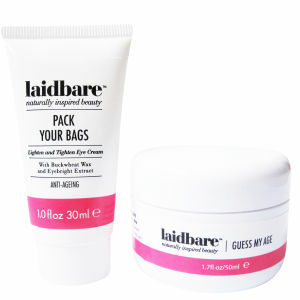 The Laidbare Anti-Ageing Duo contains an eye cream and a face cream that work together to target the signs of ageing, leaving you with a smoother, brighter and more youthful-looking complexion. - L.M. 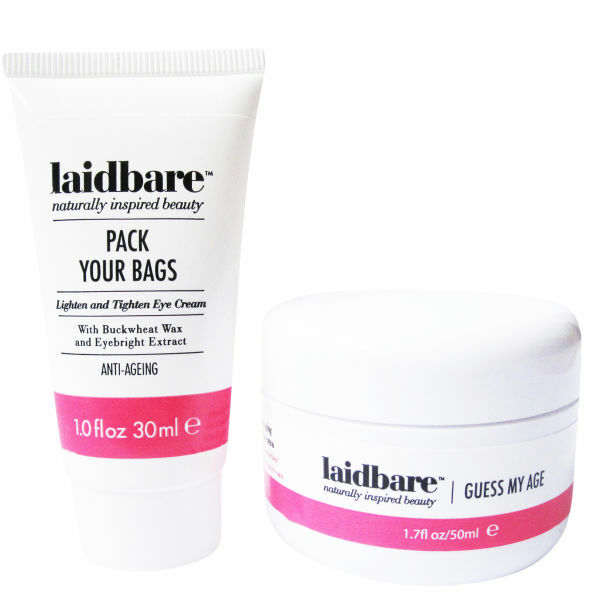 Pack Your Bags Eye Cream 30ml: Say goodbye to tired and dull-looking eyes with this clever cream. Enriched with buckwheat wax which helps to reduce puffiness and darK circles, it also contains nourishing shea butter to deliver intense hydration to the delicate skin around your eyes. Your eyes will be left looking bright and awake. Guess My Age Anti-Wrinkle Cream 50ml: Formulated with active prodejine, which strengthens the bonds between the skin's layers to bring you smoother and younger-looking skin, this effective cream is perfect whether you have deep set wrinkles or your first lines. Enriched with anti-ageing passion flower oil, potassium and vitamins A, B and C, it helps to maintain glowing, healthy skin.